This got me wondering: did Lewis Carroll wander the Crystal Palace and make a point of visiting the animal tableaux? 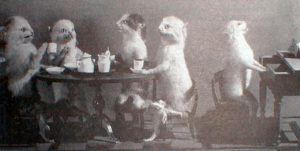 Might the work of Plouquet and Potter have inspired, in some small way, some of the more iconic scenes in Alice’s adventures, such as the Mad Tea Party? Was Carroll perhaps struck—as I was, when I first began my descent into the weird world of Victorian taxidermy—by the strange, sutured nature of the anthropomorphic stuffed animal? The subjects in anthropomorphic animal taxidermy occupy a bizarre no-man’s-land of identity, being simultaneously animal, object, and human. In a culture famously fond of categorization, the appeal of these sutured creatures is at least a little odd. But Carroll’s Wonderland seems to have a similar resistance to easy categorization—flamingoes serve as croquet mallets, playing cards rule kingdoms, and Hatters take tea with March Hares. Further, the denizens of Wonderland often play fast and loose with pronouns. The Dormouse, who is alternatively guest and ‘cushion’ at the tea party, is referred to as ‘it’ and ‘he’ within the same scene—even as the Hatter balks at Alice’s assumption that Time (represented as both man and timepiece) is a ‘he,’ thank you very much, and not an ‘it.’ We also see characters frequently broken down into disassembled parts, such as the Cheshire cat appearing as disembodied teeth. In my article in Victorian Review 43.1, I set out to explore Carroll’s Wonderland as a kind of absurdist natural museum. I wondered whether the anxious imagination inherent to Victorian taxidermy might serve as a useful model through which we might approach categorization—or the apparent resistance to categorization—in Alice’s adventures. Imagining identity construction in Wonderland as the result of the assembly, disassembly, and re-suturing of various parts may be one way to approach the classic riddle in Carroll’s text: how is a raven like a writing desk?